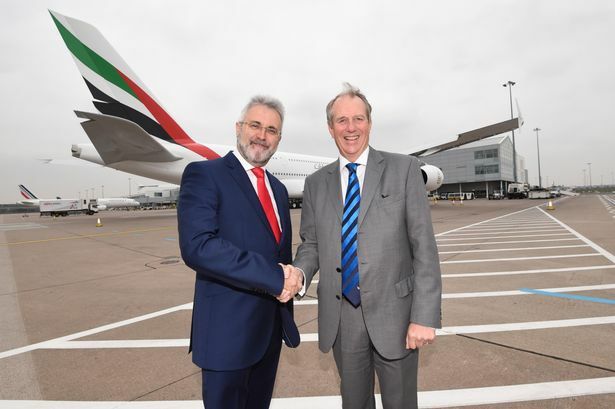 Laurie Berryman Head of Emirates in the UK and Chief executive Paul Kehoe chief executive of Birmingham Airport. Offering people links to international destinations, it is fitting that Birmingham Airport sponsors the Export category at this year’s Birmingham Post Business Awards. Chief executive Paul Kehoe explained one of the chief reasons for the backing is the honour that BPBA offers to companies aiding the economic success of the city. He said: “The Birmingham Post Business Awards focus on local businesses, both established and start-up, that are contributing to the overall success of our economy and helping to attract trade and inward investment, and for this reason, we support this awards scheme. “Being the business paper for Birmingham, the accolade that both the nominations and awards carry with them is a huge achievement to all that are involved. Mr Kehoe also explained how he believes Birmingham helps business to thrive. He said: “It’s at the heart of manufacturing, has the biggest legal system and business support outside of the capital. “It’s at the centre of a £110 billion regional economy and has the largest concentrate of businesses outside of London, with 2000 international firms and world famous brands such as HSBC, Deutsche Bank, JLR, Mondelez and KPMG. Mr Kehoe further explained that the BPBA export category naturally aligned with the airport’s own industry, because of it is global connectivity that supports export and trade. He said: “We have sponsored the export award for many years now and enjoy learning about those companies which are exporting successfully from Birmingham – some of which rely on air travel to meet their business demands. The airport celebrated its 15th month of consecutive record -breaking growth in May and experienced its busiest year ever in 2015, with 21.4 per cent growth in long haul traffic. With this success in tow, Mr Kehoe concluded by explaining what the future holds for Birmingham Airport. “Providing even greater connectivity to the destinations that our region’s business and leisure travellers want is a priority,” he said. “Global connectivity supports trade and attracts inward investment, so we have a vital role in the Midlands to further improve this by growing access to long haul markets and helping to re-balance the UK’s economy. BPBA have grown in popularity to become one of the most important events in the region’s professional calendar with 650 in attendance last year and a record number of entries from more than 100 businesses. This year’s gala will be held on Wednesday, October 26 at ICC Birmingham. Hosts will be comedian and TV personality Dominic Holland and ITV weather presenter Emma Jesson.